Up to 50 meters of Norway’s new security fence could be teared down and rebuilt. Supposed to be finished before winter frosts set in, the nearly completed fence seems to run into more trouble than outcry from critics. On Friday, the Norwegian border Commissioner discovered that the fence could have been erected too close to Russia. The border agreement says a 4 metre wide zone along the actual border line should be without barriers. «We are possibly talking about centimeters in the area closest to the road,» says border Commissioner Roger Jakobsen to the Barents Observer. But, those few centimeters too far to the east in mistake would need to be corrected. Border Commissioner Jakobsen says the uncertainty relates to about 50 meters of the fence. «If control measurements show that there is indeed deviation close to the road, then the fence will be moved the necessary centimeters,» Roger Jakobsen says. Jakobsen has informed the Russian border Commissioner about the possible deviation, but Russia has not made any comments to the issue. Possible adjustments will be done by the entrepreneur and might as well include digging up the deep concrete pile foundations, triggering extra costs. The 200 metre long and 3,5 meter high fence has a price tag of around 4 million Norwegian kroner (€440,000). The fence is aimed to lock down the border crossing area in case of a new flow of migrants like Norway experienced last autumn when around 5,500 persons entered on the only road connecting Russia and Norway in the high north. 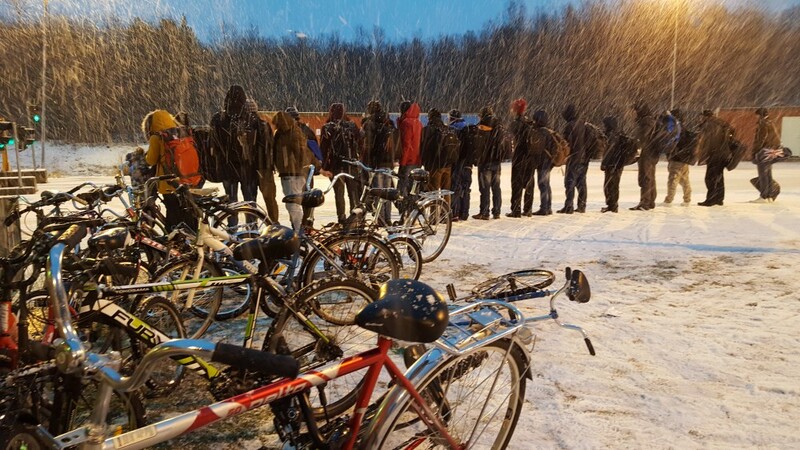 Bicycling migrants made world-wide headlines last year when they came the last few meters to Norway in the snow in what became know as the Arctic migrant route via Russia to Europe. Also the new security fence being erected has made headlines across international news outlets the last few weeks. The New York Times wrote that the fence reflects a wider shift in public attitudes against refugees. Norway’s daily Aftenposten wrote an editorial stating that a 200 metre long fence on a border that is 196 kilometres has no practical means. Other critical voices [including the Barents Observer] expressed a fear that such fence sends a wrong signal for cross-border ties with northern Russia. On Friday, the first asylum seeker since November 30th last year came on bicycle to Storskog checkpoint. The man, a Russian citizen, was returned back on the very same bicycle on Saturday, NRK Finnmark reports. Police at Storskog, however, maintained passport control on the actual border line when the Barents Observer came to Storskog from Russia late Saturday evening. Extra control on the borderline is addition to the actual passport-desks inside the building.